Description: Biennial to short-lived monocarpic perennial, erect, 3-8 dm tall; stems mostly solitary, occasionally branched from the base; basal leaves in a rosette, senescent at flowering; basal leaves ovate in outline, 3-5 cm long, pinnatifid in 9-15 linear divisions, 3-11 mm long; stem leaves gradually reduced in size; inflorescence a terminal and 6-11 lateral cymose clusters, restricted to the upper half of the stem, the lateral cymes 5-50 mm long when in fruit; calyx 5-6 mm long, cylindrical, 5-lobed, the lobes 1-2 mm long; corolla pink, tube 15-18 mm long, subsalverform, 5-lobed, the lobes spreading to slightly reflexed, 6-8 mm long, 3-4 mm wide; stamens 5; anthers and stigma included; fruit a capsule. Flowers July to September. Similar Species: As a rosette, this species is indistinguishable from Ipomopsis aggregata ssp. formosissima (skyrocket), which grows in the same habitat, but has red-orange flowers with anthers and stigma exserted beyond the throat of the corolla tube. 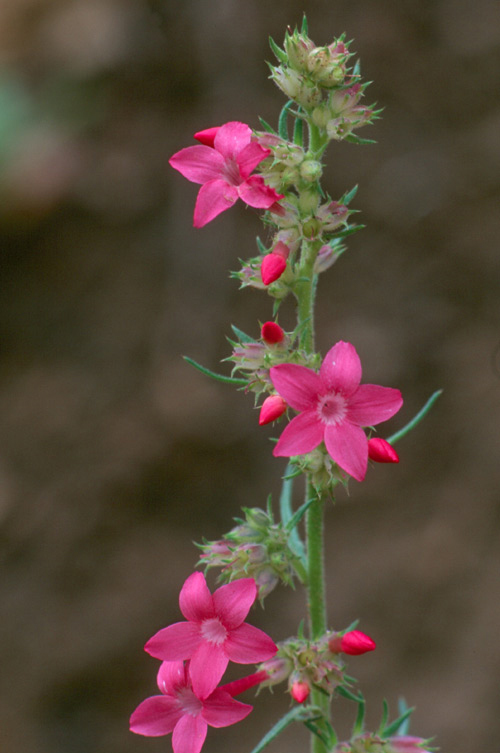 There are four other ipomopsis with pink flowers in New Mexico. Ipomopsis longiflora and I. pumila are both annuals less than 3 dm tall. Ipomopsis aggregata ssp. candida and I. a. ssp. collina are perennials that match I. sancti-spiritus in height, but have corolla tubes 20-40 mm long. Distribution: New Mexico, San Miguel County, found in only one canyon in the upper Pecos River drainage of the southern Sangre de Cristo Mountains. Habitat: It grows on relatively dry, steep, west to southwest-facing slopes in open ponderosa pine or mixed conifer forest at 2,400-2,500 m (7,730-8,220 ft). The geologic substrate is partly weathered Terrero limestone. Remarks: This plant appears to grow best in bare mineral soils with its highest densities on disturbed sites such as road cuts. Conservation Considerations: The sole location for this plant is along a road to a campground in a canyon developed for summer homes. Road maintenance, recreation and associated traffic, and catastrophic forest fire are immediate management concerns. In the long term, present land uses in the area influence management away from frequent disturbances that produce the early successional habitats to which this plant is best adapted. The species is highly palatable to wildlife and livestock. *U.S. Fish and Wildlife Service. 2002. Holy Ghost ipomopsis (Ipomopsis sancti-spiritus) recovery plan. U.S. Fish and Wildlife Service, New Mexico Ecological Services Field Office, Albuquerque, New Mexico. *Wilken, D.H. and R. Fletcher. 1988. Ipomopsis sancti-spiritus (Polemoniaceae), a new species from northern New Mexico. Brittonia 40:48-51. Roth, D. 2016. Ipomopsis sancti-spiritus (Holy Ghost ipomopsis) Recovery summary report. Section 6, Segment 30). Unpublished report prepared by EMNRD - Forestry Division, Santa Fe, NM, for the U.S. Fish & Wildlife Service, Region 2, Albuquerque, NM.